Dental Care Group is committed to safeguarding your oral health, hygiene, and overall wellbeing. Our clinic welcomes those from Armadale, Malvern and surrounding areas. Whether you need a 24/7 emergency dentist, general dentistry or high-end treatments like cosmetic procedures, restorative dentistry, endodontics (root canal treatment), the doors to our state-of-the-art clinic in Armadale are open to all. Our team ensures top-notch and complete dental treatments for patients of all ages! Explore our suburb profiles below. Brushing your teeth and flossing every day isn’t the only way you can protect your teeth from plaque and other oral health problems. Visiting your dentist in Armadale every six months for regular teeth cleaning and check-up is another! 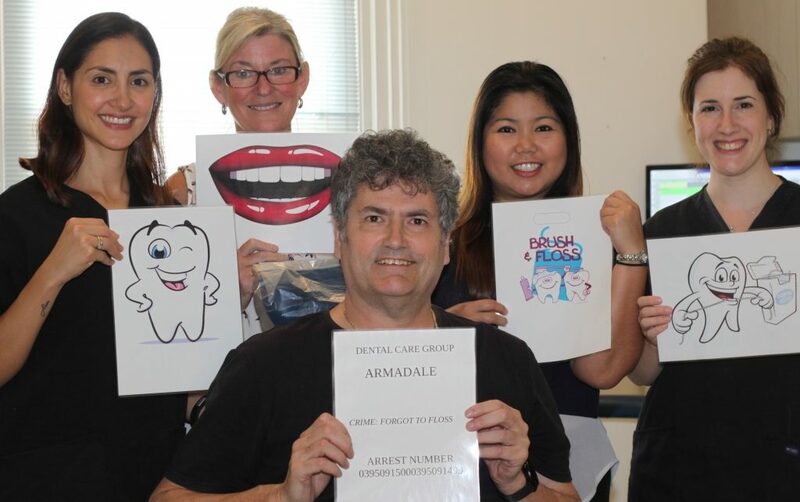 Arrange a consultation with our Armadale dental clinic for a complete range of cosmetic, restorative, emergency and general dental treatments for you and for your family. Brushing your teeth is a habit everyone should maintain… but are you doing it right? Your local hygienist doesn’t just diagnose dental hygiene problems – they can also teach you proper brushing techniques, decay prevention and cleaning routines. Protect your teeth from cavities and other serious gum diseases by making a habit out of visiting Dental Care Group. Located a quick 10-minute drive away from this small suburb, Dental Care Group is a caring, friendly, and experienced dentist for those who call Elsternwick home. Whether you need teeth whitening, preventative treatments or even emergency dentistry, Dental Care Group performs each treatment with the utmost care, compassion, and skill! Persistent bad breath can be caused by plaque and other bad bacteria. Left untreated, this can result in tooth decay. Glen Iris residents can get specialised treatment for their halitosis from Dental Care Group, just a 10-minute drive away. Located a quick 5-minute walk away from Malvern station, our Armadale dental clinic is the number 1 choice for dental treatment in Malvern. Do you ever wish your teeth were just a little bit whiter? Pay a visit to Dental Care Group. Our cosmetic dentistry procedures (including teeth whitening) will get your teeth shining once more! Losing a tooth can be traumatic, not to mention embarrassing. But you don’t have to endure the pain and the discomfort of a missing tooth any longer! Modern dentistry means you aren’t forced to rely on dentures for the rest of your life any more. Procedures like dental implants restore the function and appearance of your smile. Contact Dental Care Group to learn what treatment is best for you. Looking for a family dentist in South Yarra? Every member of your family deserves quality dentistry, no matter what the problem is. Whether it’s your children seeing the dentist for the first time or finding care for older patients, we take a sensitive and delicate approach of dental care to every member of your family. Broken teeth can cause huge discomfort and pain when you eat. Not only is it painful, but it can also lead to infection too. If you live in St Kilda, Dental Care Group has you covered. Our team offer advice for broken teeth, including root canal, restorative dentistry or even total removal depending on the condition of your tooth. Being forced to get dentures – or worse, carry on with missing teeth – can be both inconvenient and deeply upsetting. Thankfully, modern restorative dentistry means more people than ever before can affordably return to a good-looking, healthy smile when faced with tooth damage or general wear-and-tear. Curious? Get in touch with Dental Care Group to learn which restorative procedures are most appropriate for you. Choosing between veneers or crowns? Choose the right cosmetic treatment for you with the help of your local dentist. We help Windsor residents restore and enhance the natural appearance of their teeth with dental procedures that strengthen weakened or damaged teeth. Book an appointment with Dental Care Group to discuss cosmetic dental treatment that restores your dazzling smile!